Scientists from the Rabaul Volcano Observatory carried out a 4-day investigation at Lamington and concluded that there was no new volcanic activity. For the previous 3-4 weeks rumors had been circulating that Lamington was active, with reports of "fire" and "smoke" emanating from the volcano, felt earthquakes, and volcanic noises. Lamington has continued the trend of relative quiet during mid-January to the end of March 2006. Consistent reporting has been difficult due to overcast weather. Small volumes of thin white vapor were released during this time. No audible noises or glow were recorded. High frequency earthquakes continued to be recorded. The highest total was 25 recorded on 18 February. The Darwin VAAC stated on 24 April that reports of an eruption at Lamington on 22 April were false. Based on information from Geoscience Australia and satellite imagery, the Darwin VAAC originally reported that an E-drifting ash cloud from Lamington seemed to be evident on satellite imagery on 22 April at 1741. Thunderstorms near the volcano made it difficult to locate possible ash on satellite imagery. On 23 April at 1135 a flight service reported that no volcanic activity was observed at Lamington. A team from the Rabaul Volcano Observatory is investigating rumors of activity at the volcano. "A brief aerial and ground inspection was carried out at the summit on 12 October. Most of the 1951 summit crater dome had a dense canopy of vegetation, broken only by a number of thermal areas scattered around the summit. Weak vapour emission was noted from fumaroles. Temperatures were measured in one of the larger thermal areas; the highest reading was 93°C. In 1973, the highest temperature recorded in the same thermal area was 362°C. This temperature decrease is consistent with the visual impression of declining activity. Seismic surveillance from a station near the summit was suspended in 1989; measurements in November revealed no volcanic seismicity." Information Contacts: B. Talai and C. McKee, RVO. The instrumented, yet now-quiet Mount Lamington resides on the SE peninsula of the main island of Papua New Guinea. It lies roughly across that peninsula from the capital city of Port Moresby and 40 km inland from the Solomon Sea. Lamington's summit contains ragged peaks and a U-shaped crater open to the N. The volcano is ~21 km SSW of Popondetta Town, the provincial center for Oro Province. Lamington does not erupt frequently like Manam and Ulawun, but had a single historical eruption of such magnitude that, if repeated, could be catastrophic for the more than 30,000 people who live nearby. 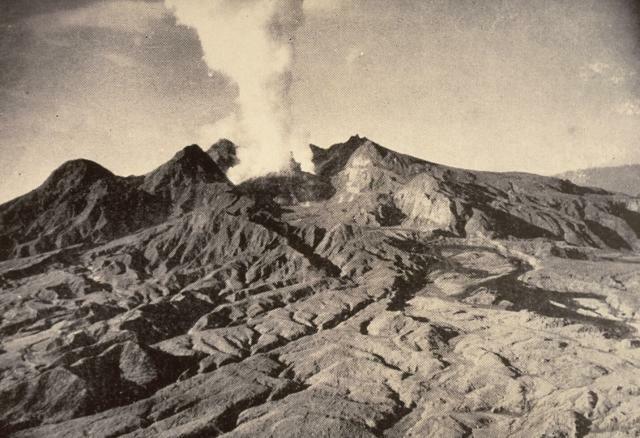 About fifty years ago, on 21 January 1951, a major explosive eruption at Lamington killed ~3,000 people, the most of all historical volcanic eruptions in Papua New Guinea. 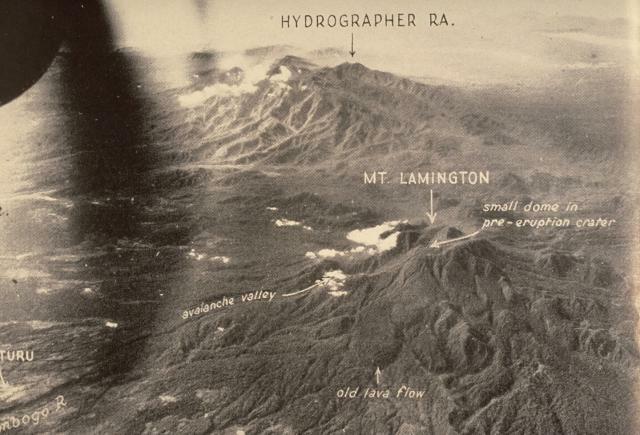 Before the 1951 eruption, Lamington was not known to be a volcano. The group of mountains where the volcano stands was covered in thick jungle and there were no stories to suggest that eruptions had occurred before. As documented in a classic study by Taylor (1958), the paroxysmal eruption was not a sudden happening, but had begun several days earlier when nearby residents started to see changes in the summit area. The pyroclastic flow from the eruption devastated an area of ~200 km2, forming a radial pattern around the volcano that extended slightly farther on the N side. Two photos illustrating aspects of the eruption appear in figures 1 and 2. One of the hallmarks of Taylor's study was his well-developed timelines that clearly stated the sequence of events. Figure 1. 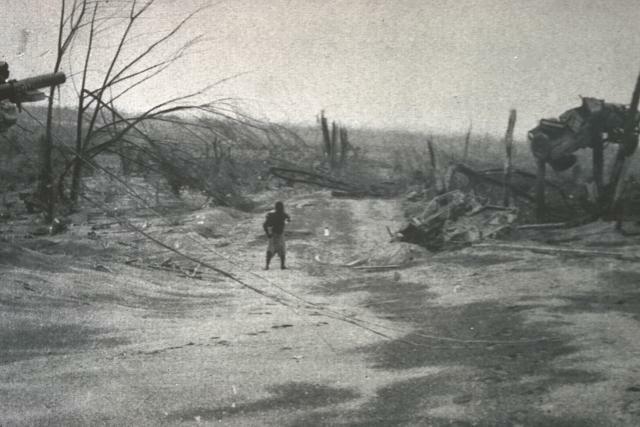 In an area devastated by a Lamington nuée ardente (pyroclastic flow) on 21 January 1951; this motor vehicle was left suspended in two truncated trees. The person shown for scale is staff member Leslie ToPue, who worked at RVO until 1992. The spot shown lies on the N flank, 9-10 km from the summit dome (in the N end of the settlement of Higaturu), an area directly in front of the summit crater's prominent opening. This photo is cropped from one included in Taylor (1958, 1983) as his figure 69 (page 56). Courtesy of RVO. Figure 2. Photograph of Lamington taken on 8 February 1951 looking northward into the summit crater's prominent opening and onto the adjacent area immediately downslope of the crater, called Avalanche Valley. The crater contains the steaming dome that grew after the paroxysmal eruption. The mid- to fore-ground shows the ash-mantled NNE slopes (the subject of most of this part of the photo) and mudflow deposits (dark zones, sweeping across limited areas in the right center). This photo came from Taylor (1958, 1983 figure 118 on page 84). Hastily arranged monitoring commenced immediately after the 1951 eruption but only operated during the active phase of the eruption. A more permanent monitoring program began in 1970 with the installation of a seismograph. In October 1996, a modern seismic station and an electronic tiltmeter were installed on Lamington. Currently RVO has permanent, smaller observatories at Lamington, as well as at Ulawun, Langila, Karkar, Manam, and Esa'ala. Each is equipped with a recording seismograph. In addition, the stations at Lamington, Ulawun, Karkar, and Manam contain real-time high-frequency data-transmission systems that allow RVO volcanologists to remotely monitor those sites. Since the 1951 eruption, seismic activity has been absent to rare. Seismic records on 21 December 2000 and 17 February 2001 showed several hours of very high seismicity, but it was difficult to ascertain the cause. Reference. Taylor, G.A.M., 1958 (2nd ed., 1983), The 1951 eruption of Mount Lamington, Papua: BMR (Australia) Bulletin 38, Australian Government publishing service, Canberra (ISBN 0 644 01969 7; ISSN 0084-7089). Information Contacts: Ima Itikarai, Rabaul Volcano Observatory (RVO), P.O. Box 386, Rabaul, Papua New Guinea. During most of April 2002, residents of Popondetta Town, ~21 km NNE of Lamington, and villages near the volcano were besieged by rumors of the volcano showing signs of renewed activity. Later investigations found no evidence of volcanism. Some of the rumors included fire and "smoke" from the volcano, felt earthquakes, and noises. As a result of the rumors, a couple of schools closed, some residents buried their belongings for safekeeping, and others prepared to evacuate. At the time it was difficult for the Rabaul Volcano Observatory (RVO) to confirm or deny the reports because the monitoring equipment for Lamington had not been operating since October 2001. Based on information from Geoscience Australia and satellite imagery, the Darwin VAAC reported that an E-drifting ash cloud from Lamington seemed to be evident on satellite imagery on 22 April at 1711. The height of the cloud was not known due to thunderstorms in the area making it difficult to detect ash. However, on 23 April at 1105 a flight service reported that no volcanic activity was evident at Lamington. 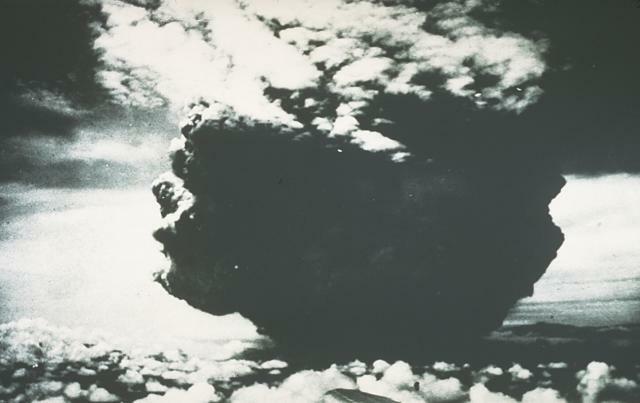 By 26 April Darwin VAAC had concluded that the suspicious cloud was not related to volcanism. Investigations by the Geological Survey of PNG (RVO and PMGO) of the Department of Mining were carried out during 21-25 April (courtesy of funding from AusAID). On 28 April 2002, RVO reported that, after 3-4 weeks of rumor and speculation suggesting Lamington was showing signs of renewed volcanic activity, none had occurred. Monitoring equipment was restored during the trip, and seismic recordings during those few days showed no seismicity. A very brief aerial inspection of the summit area showed no concrete evidence of renewed volcanic activity. There were no changes in the topographical features or vegetation to indicate recent activity. Small amounts of vapor were being emitted from a few fumarole locations, but that activity was not a new development. There have been no additional reports of unusual activity or increased seismicity through February 2003. The Rabaul Volcanological Observatory reported that Lamington remained quiet over the period 25 June-9 October 2003. Vapor emissions were difficult to observe because of the distance to the observation point, but on a few clear days very small volumes of thin white vapor were seen in the summit area. The report also noted that high-frequency volcano-tectonic-like earthquakes began in early July at a rate of up to five events per day and continued into early October. This is the first time since the seismic station was re-established in 1997 that these types of earthquakes have been recorded in significant numbers over a short period of time. Information Contacts: Ima Itikarai, Rabaul Volcanological Observatory, P.O. Box 386, Rabaul, Papua New Guinea. Lamington remained quiet during 10 October-14 December 2003. Cloud cover over the summit area made visual observations difficult, and the earthquake recorder did not function due to technical problems. Although it was difficult to make a reliable prognosis based on very limited data and information, Rabaul Volcano Observatory expected Lamington to remain quiet. Lamington is an andesitic stratovolcano with a 1.3-km-wide breached summit crater containing a lava dome. Prior to its renowned devastating eruption in 1951, the forested peak had not been recognized as a volcano. Mount Lamington rises above the coastal plain north of the Owen Stanley Range. A summit complex of lava domes and crater remnants tops a low-angle base of volcaniclastic deposits dissected by radial valleys. A prominent broad "avalanche valley" extends northward from the breached crater. Ash layers from two early Holocene eruptions have been identified. After a long quiescent period, the volcano suddenly became active in 1951, producing a powerful explosive eruption during which devastating pyroclastic flows and surges swept all sides of the volcano, killing nearly 3000 people. The eruption concluded with growth of a 560-m-high lava dome in the summit crater. Mori J, McKee C, Talai B, Itikarai I, 1989. A summary of precursors to volcanic eruptions in Papua New Guinea. In: Latter J H (ed), Volcanic Hazards - Assessment and Monitoring, Berlin: Springer-Verlag, p 260-291. Ruxton B P, 1966. Correlation and stratigraphy of dacitic ash-fall layers in northeastern Papua. J Geol Soc Aust, 13: 41-67. Taylor G A, 1958. 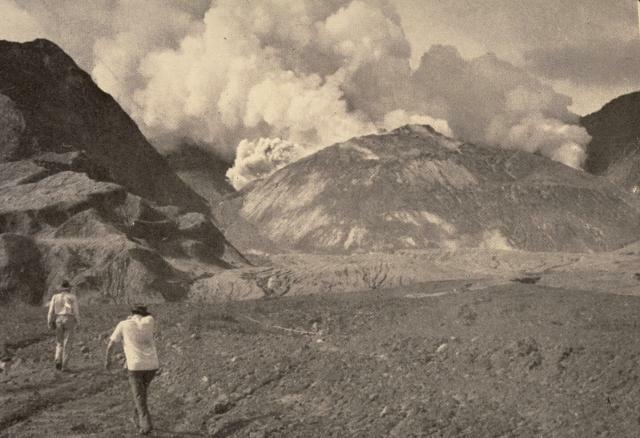 The 1951 eruption of Mount Lamington, Papua. Aust Bur Min Resour Geol Geophys Bull, 38: 1-117. There is no Deformation History data available for Lamington. There is no Emissions History data available for Lamington. The Hydrographers Range, seen here from the west, is a forested, deeply dissected volcanic massif extending from the eastern margin of Mount Lamington (lower right) to the northern coast of Papua New Guinea. Most activity took place during the Pleistocene, but perfectly preserved cinder cones and explosion craters on the southern side and on the high country overlooking Songade village on the coast suggest that some Holocene activity occurred. This 1947 photo was made prior to Lamington's catastrophic eruption in 1951. Photo by Royal Australian Air Force, 1947 (published in Taylor, 1958). Members of a scientific team approach the crater of Mount Lamington through the avalanche valley on February 11, 1951. Explosions issuing from a vent behind the new lava dome being emplaced in the summit crater produce billowing clouds of steam and ash. Growth of the lava dome began soon after the catastrophic January 21 explosive eruption. At the time of this photo, the smooth-surfaced lava dome was uplifting the floor of the new crater. The dome eventually grew to the height of the crater rim. Photo by Tony Taylor, 1951 (Australia Bureau of Mineral Resources). This dramatic photograph of the catastrophic eruption of January 21, 1951 was taken by the pilot of a commercial aircraft flying from Port Moresby to Rabaul. From about 40 km NW, the pilot observed this powerful eruption column, which rose to a height of about 13 km within two minutes. Shortly afterwards, the cloud expanded horizontally away from the volcano, as devastating pyroclastic flows and surges swept radially up to 12 km from the crater. Photo by Capt. Jacobson, 1951 (published in Taylor, 1958). 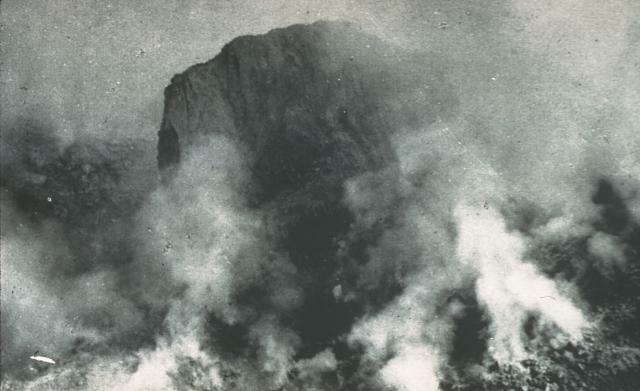 On August 19, this large knife-edged spine towered about 130 m above the surface of the growing lava dome. Uplift of the central spine ceased at about this time. Extrusion and destruction of lava spines occurred frequently during the five-year long period of lava dome growth. The vehicle at the upper right was suspended 3-m above the ground between the tops of two truncated trees by the devastating pyroclastic surges of the January 21, 1951 eruption of Mount Lamington. The vehicle was located in the village of Higaturu, 10 km north of the volcano. Velocities of the pyroclastic surges were estimated to be in excess of 120 km per hour. The high-temperature surges destroyed the village, removing houses from their foundations and demolishing a steel-framed hospital building. The first historical eruption of Lamington, not known to be a volcano by those living on its fertile flanks, took place in 1951. Following continuous light ash emission beginning on January 17, the paroxysmal eruption on January 21 produced pyroclastic flows and surges that swept all sides of the volcano to a maximum distance of 12 km on the north, killing nearly 3000 people. This February 5 photo shows the denuded northern flanks of the volcano and steam rising from a growing lava dome in the new crater. Slow dome growth ended in 1956. 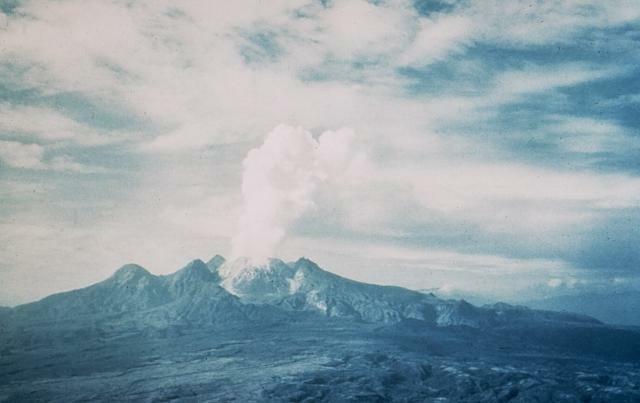 Mount Lamington, seen here in eruption from the north in late 1951, is an andesitic stratovolcano with a 1.3-km-wide breached summit crater containing a lava dome. Prior to its renowned devastating eruption in 1951, the forested peak had not been recognized as a volcano. The catastrophic 1951 eruption produced devastating pyroclastic flows and surges that swept all sides of the volcano, killing nearly 3000 people. The eruption concluded with growth of a 560-m-high lava dome in the summit crater. Photo by Tony Taylor, 1951 (courtesy of Wally Johnson, Australia Bureau of Mineral Resources). 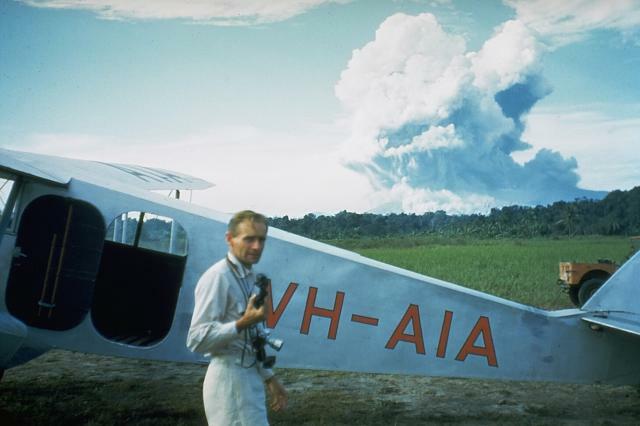 Australian volcanologist Tony Taylor stands beside the light aircraft he used to make observations of Mount Lamington, which is erupting in the distance on February 5, 1951. Taylor was detailed to investigate the catastrophic eruption of Lamington, which previously had not been recognized as a volcano by those living on its slopes. He conducted painstakingly detailed investigations on the course of the eruption. His landmark 1958 paper became a volcanological classic on the analysis of a major pelean eruption. Photo courtesy of Wally Johnson, 1951 (Australia Bureau of Mineral Resources). There are no samples for Lamington in the Smithsonian's NMNH Department of Mineral Sciences Rock and Ore collection. Large Eruptions of Lamington Information about large Quaternary eruptions (VEI >= 4) is cataloged in the Large Magnitude Explosive Volcanic Eruptions (LaMEVE) database of the Volcano Global Risk Identification and Analysis Project (VOGRIPA).